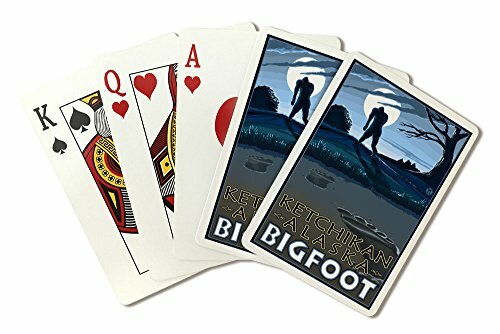 Premium quality poker size playing cards of Amazing Bigfoot Stories (Playing Card Deck - 52 Card Poker Size with Jokers), printed right in America! 52 cards plus jokers included, with a tuck box for storage. Printed on heavy stock paper using a high-end digital printing press guarantees: color accuracy, durable imaging, and the highest print resolution available. This print is 100% Made in America. We use only fine art inks, which are fade-resistant, museum-quality archival quality, with acid-free pigment. Lantern Press is a dynamic art company that specializes in the world's leading imagery. Our collection includes original works created by our in-house art team, photography, home & office decor trends, vintage art, and more. Your support allows us to continue doing what we love - creating beautiful art. The hunt for Bigfoot is on! Play your wildest games with this unique deck of cards. Hand Illustrated, court cards feature a unique Sasquatch sighting from around the world. Fun to play or collect, this deck is one-of-a-kind with intriguing detail. The players have teams of downhill snowboard racers and are competing with each other for the coveted Yeti cup. Movement is managed by playing cards to move their racers, but all players also have cards which cause the Yetis, watching from the hills on each side of the race course, to throw snowballs at the racers, trying to knock them out of the race. Thus, it becomes a sort of obstacle course as the racers race down the course as fast as they can, but always on the alert for snowballs. The player to get his entire team across the finish line first, wins the Yeti cup and the game!